German Talmudist of the twelfth century. He was a nephew of Ephraim b. Jacob of Bonn, with whom he carried on a scientific correspondence; he had also personal relations with Eliezer b. Joel ha-Levi. As far as is known, Jacob was the first to write a monograph on circumcision. The work published by Glassberg in his collection "Zikron Berit ha-Rishonim." 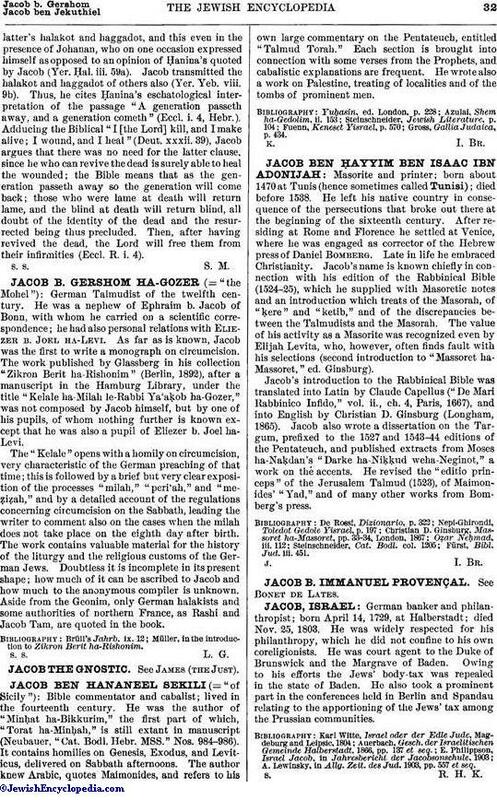 (Berlin, 1892), after a manuscript in the Hamburg Library, under the title "Kelale ha-Milah le-Rabbi Ya'aḳob ha-Gozer," was not composed by Jacob himself, but by one of his pupils, of whom nothing further is known except that he was also a pupil of Eliezer b. Joel haLevi. The "Kelale" opens with a homily on circumcision, very characteristic of the German preaching of that time; this is followed by a brief but very clear exposition of the processes "milah," "peri'ah," and "meẓiẓah," and by a detailed account of the regulations concerning circumcision on the Sabbath, leading the writer to comment also on the cases when the milah does not take place on the eighth day after birth. The work contains valuable material for the history of the liturgy and the religious customs of the German Jews. Doubtless it is incomplete in its present shape; how much of it can be ascribed to Jacob and how much to the anonymous compiler is unknown. Aside from the Geonim, only German halakists and some authorities of northern France, as Rashi and Jacob Tam, are quoted in the book. Müller, in the introduction to Zikron Berit ha-Rishonim.